Psychometric tests have been used since the early part of the 20th century and were originally developed for use in educational psychology. These days, outside of education, you are most likely to encounter psychometric testing as part of the recruitment or selection process. Tests of this sort are devised by occupational psychologists and their aim is to provide employers with a reliable method of selecting the most suitable job applicants or candidates for promotion. Psychometric tests aim to measure attributes like intelligence, aptitude and personality. They provide a potential employer with an insight into how well you work with other people, how well you handle stress, and whether you will be able to cope with the intellectual demands of the job. Most of the established psychometric tests used in recruitment and selection make no attempt to analyze your emotional or psychological stability and should not be confused with tests used in clinical psychology. However, in recent years there has been rapid growth (particularly in the US) of tests that claim to measure your integrity or honesty and your predisposition to anger. These tests have attracted a lot of controversy, because of questions about their validity, but their popularity with employers has continued to increase. 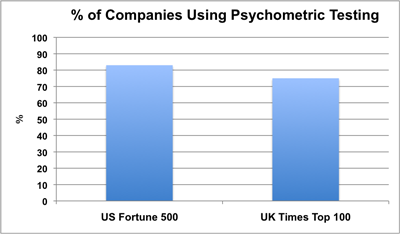 Psychometric testing is now used by over 80% of the Fortune 500 companies in the USA and by over 75% of the Times Top 100 companies in the UK. Information technology companies, financial institutions, management consultancies, local authorities, the civil service, police forces, fire services and the armed forces all make extensive use of use psychometric testing. As an indicator of your personality, preferences and abilities, psychometric tests can help prospective employers to find the best match of individual to occupation and working environment. As a recruitment and selection tool, these tests can be applied in a straightforward way at the early stages of selection to screen-out candidates who are likely to be unsuitable for the job. They can also provide management with guidance on career progression for existing employees. Personality has a significant role to play in deciding whether you have the enthusiasm and motivation that the employer is looking for. It also determines how well you are going to fit in to the organization, in terms of your personality, attitude and general work style. In most working situations it's the personalities of the people involved that affect the day-to-day success of the organization. If a manager can't motivate their staff or the team doesn't work well together, then quality of service and productivity will suffer. There have also been significant changes in the past 20 years in the way that organizations operate. For example, management styles tend to be less autocratic and there are usually fewer levels of management than there were. The move towards more knowledge based and customer focused jobs means that individuals have more autonomy even at fairly low levels within organizations. In addition, most organizations expect to undergo frequent changes in the way that they operate in order to remain competitive. All of these factors have contributed to your personality being seen as more important now than it was in the past. If you are unsure what types of question to expect then ask the human resources department at the organization you are applying to. This will not count against you as you have a right to prepare yourself for any tests you are asked to sit. Aptitude tests consist of multiple choice questions and are administered under exam conditions. They are strictly timed and a typical test might allow 30 minutes for 30 or so questions. You can practice numerical and verbal reasoning aptitude/psychometric tests using apps such as Psychometric Tests on the iPhone. It is very important that you don't make any assumptions about your own abilities in these areas. For example, many people assume that they won't have any problems with verbal ability questions because they once got an 'A' in an English exam. They may have a point if they got the 'A' a few months ago, but what if it was ten years ago? It is very easy to ignore the effects of not reading as much as you used to, and of letting your spell-checker take care of correcting your written English. The same thing applies to numerical ability. Most people who have been out of education for more than a few years will have forgotten how to multiply fractions and calculate volumes. While it is easy to dismiss these as 'first grade' or elementary maths, most people simply don't do these things on a day-to-day basis. So, don't assume anything - it's better to do some practice tests and then you'll know for sure.